A picture is worth a thousand words. Especially for a website, the importance of images is evident from the enormous difference in the impacts a text-only versus an image-only website has on your minds. And in the current scenario when internet marketing is one prime marketing channel, you need to make sure everything’s proper. As for images, they not only contribute towards the beauty of your site but can also be used as a marketing tactic to boost up your site’s conversion rate (how many among the viewers convert to customers) provided you use them well. Let’s take a look at a few tips and tricks about using images to boost up your site’s conversion rate. A mascot is a figure used as a symbol for an organization e.g. the bluebird of Twitter. The mascots are primarily used to create a bonding with the customers as these mascots are easy to remember for the user and serve as an identifier for your website. It also becomes really easy to convey a specific emotion using these graphic images. They have a long lasting effect in the viewers mind and are reported to be contributing a lot towards the conversion rates of various websites as it serves as a unique key to identify your company and the user can easily be directed to your website using that mascot. Emotionally attracting a viewer is one easy way of turning him from being just a viewer to a customer. You can use the images to make the viewers experience and idealize your products which naturally makes their choices easier. It’s the images that let you control the moods of your customers and not really the text. You can make them happy when you want and if they’re in the right mood when at your website, consider your product sold. So instead of just using plain photos, try to add the ones that attract and persuade your customers by targeting their emotions. Finding images online is a matter of seconds and that is because of the vast stock of photos of any type you can find on Google Images. However, a major portion of the images you’ll find there are used on more than a hundred different websites and are majorly not that impressive. Since you’re dealing with your business’s future here, you should be very careful when choosing stock photos. Avoid the viral ones but choose the ones that give a professional and proper look. Your current customers are the key to getting even more. You might have come across many sites that, in images, show their customer’s review and feedback about their service/product. That is actually a very good marketing strategy as it gives your viewer a third person review of your product and that can really be convincing at times. This also primarily is the reason why companies, in their commercials, hire some famous personalities and actors as this is one pull approach that actually gets you viewer’s preference. Instead of using the same strategies numerous other websites are using for a particular type of service, use a unique and innovative one. Don’t copy trends, rather create yours and let others follow. This creates user interest in your product and may lead him to buying that. Various mobile review sites introduced the three dimensional model of the mobile phones which lets the user view the mobile from all possible angles. This surely, at the time of introduction, was a unique concept and reports show that more than 30% of the conversion rates of such sites got boosted up just by launching this new feature. New mechanisms may be hard to produce but not impossible. Awesome tips to Increase Pageviews Using Images by the above strategies. Thanks Qasim bro. Second important thing after the post title is POST IMAGES. optimization of these images definitely improves the pageviews. Thanq for the tips. mujhay samj nhi lgi plz help me. App Ko kiya samjh nhn aya bhai please elaborate. Asslam Allekum my dear Qasim Zaid please to meet my self I am author of www.bloggerbasic.com and I have created my blog in july 2013 my blog age is 10 0r 15 days old. I have read your post very care fully because it is what i need. But I have not solved my problem about my blog previews. Can you please help me how to increase page views for my new blogger blog. Actually I want discuss on thing more today i have visited a new blog about make money by name wwww.richincomeways.com Sir I was bold I have warked hard day and night make my blog post. i do not get more than 200 hundred page views. What a magic of his author name sir Muhammad Mustafa he created his blog in jun and blog traffic 5000 amazing. What is going on I do not understand how do you get traffic gayz please please tell me the reason about it. Dear Naeem Hussain, Every has this issue in the beginning of starting their blogging journey....Do not worried about it...because your blog is still on developmental stage..you should work more for it to improve posts quantity and maintain post frequency (update blog on daily basis). Your post will start grow up if you reach at minimum of 50 posts. >>>need any help then feel free to ask. Second you have mantioned that rich income way got dozens of page views and massive traffics that all the MBT readers know very well...because recently this blog has been started by Mustafa Sir, and he announced this blog introductory at MBT. I agree with the statement of my friend Hafeez that new blog often get less visitors. I have also visited your blog and found that, you are making too many mistakes. For example- your article has a title "Most Popular SEO Tricks Before Strat Blogger". Here there is no meaning of "Strat". You are also making too many grammatical mistakes which leaves negative impact on visitors. When you write something on your blog, people think that you are an expert so try to be professional and work hard. SEO also play major role in getting targetted traffic. You have written few articles about SEO but After checking your codes present on your template, it seems that, you have not employed SEO methods yourself properly. Blogging is not an easy task bro. You need lots of hard work and motivation. recently I used one image in my post which i saved from google image. After publishing it,Macfee anti virus started showing my site as dangerous site until i remove that image. how it happened? ?Can any image spread malware or virus??? Yes i removed immediately from the site as well as from my PC. In simple words, Alpana, you can store an vulnerable exe (executable windows file) behind any jpeg image. So make sure to check the image size before uploading. Images containing virus are usual heavy. excellent post! very nice and informative. Hello there, I discovered your blog by means of Google whilst looking for a similar matter, your web site came up, it looks good. I've bookmarked it in my google bookmarks. Hello there, simply changed into aware of your blog via Google, and found that it's truly informative. I'm gonna be careful for brussels. I will be grateful in the event you continue this in future. Lots of folks shall be benefited from your writing. 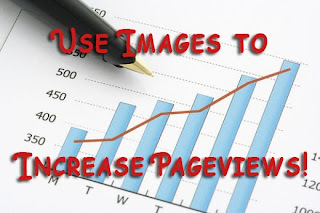 Great article..Nice tips to Increase Pageviews Using Images by the above points. Thanks Qasim bro. Images are most important factor to increase your page views. Thanks for sharing this post. what is this blogpost about ? This is a masterpiece eye opener to legit ways of increasing traffic to your website. I have never taken the use of images seriously, but will henceforth apply them for my newer posts and work on the old posts. Really Useful tips. I appreciate your efforts for writing such a nice and useful post. Asalam-o-alikum Sir, I have one problem in my blog. Comment reply is not working. When i try to reply of any comment then new tab opens and it shows an error message of like this(Whoops, that's an error. Try refreshing the page to see if things are back in order. Please help me sir. I am worry about this. Change the template simple. then your error automatically removed. But i have worked for this template. Have you any other way? Hey! Qasim thanks for sharing your valuable thoughts on such a great subject. I love to read your articles, Thanks again.